ROME - A South African chenin blanc made by "bush vines" champion Johan Joubert was named best white at one of the world's top wine competitions. This year's Concours Mondial de Bruxelles awarded the 2013 Kleine Zalze Family Reserve, a wine produced from non-trellised vines at an estate near Stellenbosch in the heart of South Africa's winelands. Bush vines are less productive than trellised vines because they afford a greater canopy of leaf coverage to the fruit. But their advocates say the lower yield is worth it because the berries have much thicker skins and therefore produce more concentrated flavours. More than 320 experts from more than 50 countries chose the winning wine on Friday at the 22nd edition of the competition, which was founded in Belgium in 1994 and has been hosted in different European countries since 2006. Joubert has been a strong advocate of South African producers moving towards more concentrated chenin blanc wines, rather than relying on mass market sales of lighter and cheaper versions. Since making the award-winning wine at Kleine Zalze he has moved on to work for Boland Cellar in the Western Cape town of Paarl, where he is also winning plaudits for his chenin blanc. The winner of the best red was a Nican 2008 Montepulciano d'Abruzzo from the Orsogna winery in the mountainous region of Abruzzo, east of Rome. Montepulciano is one of the workhorse grapes of Italian viticulture, high-yielding and easy to convert into soft, quaffable wine. Increasingly however a new wave of producers are exploiting its potential to deliver something much more concentrated and complex. France claimed a double at the competition with the best sparkling and best rose prizes. The top bubbly award went to a 1999 vintage pink champagne from Charles Heidsieck, while the explosion in quality wines produced in the Languedoc-Roussillon area was recognised with Gerard Bertrand's Cote des Roses 2014 picking up the prize for best rose. Everybody knows that wine should have a good nose, but one South African vintner wants the world to believe it also needs a good ear. In a gentle valley near Stellenbosch in the Western Cape, the vineyards at DeMorgenzon estate are serenaded by baroque and early classical music day and night, all year round. And once the grapes are harvested, the maturing wine gets the same treatment in the cellar. Winemaker and general manager Carl van der Merwe smiles when asked whether he is seen in the same light as Britain's Prince Charles, who was scorned for admitting that he talks to his plants to encourage their growth. "We have a lot of people that are very sceptical about what we are doing and why we're doing it, particularly neighbours" he says. In South Africa the award-winning wines are sold in the mid-to-upper price range, retailing from about R75 ($7.5) up to R250 ($25)a bottle. DeMorgenzon exports to the United States and to Europe, where the wines sell from about 10 euros to 18 euros. Between the vineyard and the retailer, however, the wine matures in oak barrels while "listening" to the same music as the vines it came from. Surely, Van der Merwe is asked, even if one accepts that a life form like a plant can respond to music, it is a bit much to expect the same of a liquid? Happily, he points out that "wine is alive with various bacteria, and the fermentation process itself is done by living organisms". Perhaps in time, if the idea catches on, wine critics will be telling us to look out not only for "notes of berry and mushroom" in our glass of red or white, but "notes of Bach and Mozart" as well. But he is a firm supporter of the musical approach adopted by the owners of the estate, prominent businesswoman Wendy Appelbaum and her music-loving husband Hylton, who founded Classic FM radio in South Africa. The Appelbaums bought the estate in 2003 and introduced music in 2009, following in the footsteps of farmers who have serenaded everything from cows to pigs in an attempt to improve production and quality. While there was no scientific proof of music's effects on wine, they thought there was enough evidence of the positive influence of dulcet sound to try to combine their love of both. "We do things in life sometimes because we believe in them and often we find out later that there was a very strong scientific reason why those things worked," Van der Merwe says. So if wine and song go together in more ways than one, why does it have to be baroque rather than rock? "Well, we only use baroque and classical for the reason that those two have mathematical rhythm and those sound waves have been proven to have a positive effect on natural life," he says. Van der Merwe, 37, is no wild-eyed evangelist trying to spread a message about music and plants, but has a modest belief that the music works -- helped along by the terroir and, of course, his winemaking skills. He says he sees a difference the music makes through the slower and more regulated growth patterns on the vines where it is focused -- a trial block of four hectares out of the 55 hectares under vines on the estate. "The Syrah that comes from here is very different to anywhere else on the property and it's much more pronounced in terms of flavour, has smoother tannins and tends to have slightly lower alcohol and really is just a much more balanced, much more approachable wine," he says. Ten regularly spaced loudspeakers carry the music of Bach and Mozart, among many others, across the vineyards, producing a surreal effect in the quiet valley. Van der Merwe points out that the farm is like an amphitheatre scooped from the mountains, and the music's influence extends the length and breadth of the estate. "It is not so much about the audible music that we can hear, its more about sound waves," he says. The music also affects the farmworkers, of course, though Van der Merwe says wryly that many seem to prefer their own playlists on their mobile phones. But one of the local women in a pruning team told AFP: "We like the music. It's nice to work here because it lifts us up and sometimes you feel like dancing." Spring is approaching in the Cape, and the team of pruners is moving slowly through the vineyard, preparing it for the next growing season. The estate has a strong focus on chenin blanc and chardonnay, but also produces classic reds syrah and pinot noir. Take a leisurely drive through one of the many wine routes just minutes out of Cape Town. 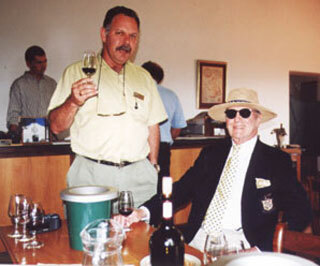 Winemakers welcome you for cellar tours and tastings. You will see historic wine towns graced with lovely Cape Dutch and Victorian buildings, charming guest houses, top-notch restaurants and interesting museums and shops. The Constantia wine route is popular for both beauty and historical significance. Established more than 300 years ago Groot Constantia is a superb example of a Cape Dutch manor house.If you want to provide comments, an item or news release to this column on line or in print, send it to "The Flying Gourmet" at airhwy@dowco.com Above: Tour operator Robert Davidowitz discusses wines in Franzhoek with Robert D'Angelo of Philadelphia. Photo by Muguette Gofurani. Visit the picturesque wine route of Franschoek, or "French Corner", also rich in history. In 1688 the French Huguenots developed the area, contributing their knowledge of wine-making. Here you will enjoy wine cellar tours, gourmet restaurants and upscale accommodations. A cluster of wineries surrounds the historic university town of Stellenbosh, the second-oldest European settlement in South Africa and an architectural gem. You will marvel at the well-preserved Cape Dutch, Georgian, Victorian and Regency buildings, many of which are national monuments. Enjoy a drive down the oak-shaded Main Street of Paarl, a winelands town with tine Cape Dutch buildings. ng wines. The Worcester route is located in the beautiful Breede River Valley. Be sure to see numerous tourist attractions and breathtaking scenery on the Swartland route.